Seawhawks used disappointment of 2017 as impetus to capture LI Class IV title. Cold Spring Harbor’s sensational football season ended with a jubilant celebration on the field of Stony Brook’s LaValle Stadium, but the die for it was cast amid profound heartbreak a year earlier. The Seahawks marched to 10 straight wins to start their 2017 season and envisioned that campaign would end in this kind of euphoria. Instead it ended with a shutout loss to Seaford in that year’s Nassau title game. The Seahawks held that pain close through a summer of workouts with the singular vision of righting what went wrong the season before. More experienced, more driven and more focused, Cold Spring Harbor did all the things in 2018 that it had not done in 2017. The Seahawks got a Nassau Conference IV championship game re-match with Seaford and rolled to a 27-7 win. And then they easily handled Shoreham-Wading River, 42-20, for the Long Island Class IV title, setting off the celebration. Cold Spring Harbor (10-2) had won at the LIC in 2001 and 2005 but needed 13 more years – often ones where their thin ranks gave them little chance – to capture a third crown. Senior tailback Danny Striano missed the ’17season with a back injury and senior quarterback Ray Costa was the second stringer. Like many of the Seahawks, they played their best football at the end. Striano, whose three younger brothers are juniors and play both ways for CSH, ran for 134 yards and three touchdowns in the win over Seaford and 215 yards and three touchdowns in the season finale. He ran for 10 touchdowns despite missing four games to a knee injury. Costa threw two fourth-down touchdown passes in the LIC and ran for another score, finishing the season with 12 passing touchdowns and 14 rushing touchdowns. 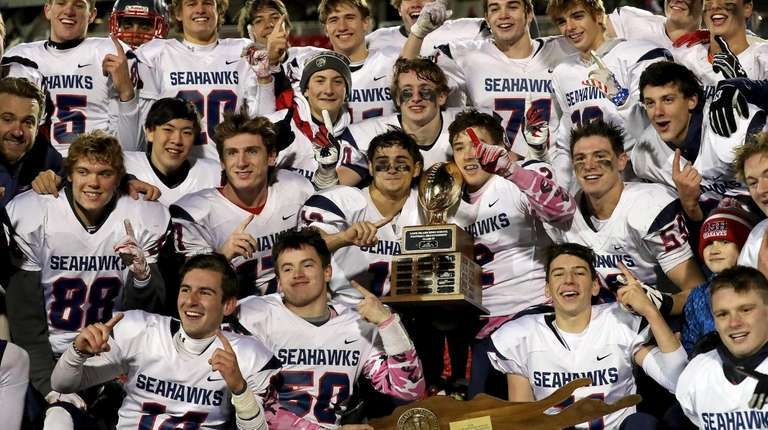 Cold Spring Harbor boasted a slew of excellent athletes however the Seahawks became special because they blended together to form a true ensemble. Junior wideout Casey Reynolds caught six touchdowns. Fullback/linebacker Richie Striano had 63 tackles (10 for a loss and four sacks) and eight rushing touchdowns. Thomas Milana returned four kicks or punts for touchdowns – all of more than 50 yards. It wasn’t so long ago that Cold spring Harbor’s ranks were too thin to even field a junior varsity team so the players on this title team took particular pride in ending the 13-year drought. Podcast: Newsday's All-Long Island football teamGregg Sarra and Roger Rubin reveal Newsday's 2018 All-Long Island football team.